1880The Society was called to order at the usual hour by the Pres. "Walter S. Lefevre" link-pointer-typeMr. Lefevre. After the calling of the roll, the minutes of the previous meeting were read & accepted. 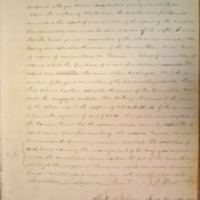 Under the head of nomination & election of members, the name of Mr. Harwood was proposed & the gentleman duly elected & duly initiated.Upon the motion of "Woodrow Wilson" link-pointer-typeMr Wilson the debate was postponed one week & the report of consideration of the report of the constitution committee was made the special order of the night. A motion that the house go into a committee of the whole was carried, & "Richard Heath Dabney" link-pointer-typeMr Dabney was appointed chairman of the committee. Under head of report of committees, "Archibald W. Patterson" link-pointer-typeMr Patterson in behalf of committee of repairs, report the purchase of a new chandelier, & requested. The report was accepted accepted & the committee discharged. "Henry M. Robinson or R.H. Robinson" link-pointer-typeMr Robinson, member of the joint committee of the two societies, reported that "George F. Holmes" link-pointer-typeProf Holmes had been selected chariman of the Committee to award the magazine medal. "Richard Heath Dabney" link-pointer-typeMr. Dabney, Chairman of the com— of the whole report the adoption of Arts II, III, IV, & V of the new constitution, & the rejection of Sec I of Art VI. HIs reported was adopted by the house. Moved that the com constitution com. be reported instructed to report some plan for awarding two medals. Carried. *A motion to reconsider the preceeding motion was lost. The resolutions of Wash. Society respecting the management of the mag. waswere deferred until the constitution com. reported the part of the constitution relating to the magazine.refurl="e14672718801211889_1" link-pointer-type="Note">* Treasurers report was made & excuses heard. Vice P's report was made & the Society adjourned. University of Virginia. Jefferson Society, “Jefferson Literary and Debating Society Minute Book,” 1880 December 11, WWP17266, Jefferson Literary and Debating Society Records, Woodrow Wilson Presidential Library & Museum, Staunton, Virginia.